Name of booth: Tezuka Shoji Co., Ltd.
Tezuka Shoji has been involved in agricultural and real estate business in Tochigi Prefecture, Kanuma. Lately there are lesser and lesser young people who wants to inherit agricultural business, and we feel that Tezuka Shoji should help to revive regional activity. Abe Mieko is the 3rd generation for Tezuka Shoji, and before she took over the family business she was a nutritionist. From her experiences, Tezuka Shoji started to have external collaborations with its traditional business, making efforts to create new innovations. We have a snack called “Kororo to Karada o Genki ni suru” (Bringing energy to your heart and body). It is a Japanese cookie that is not only delicious but also nutritious for the body. 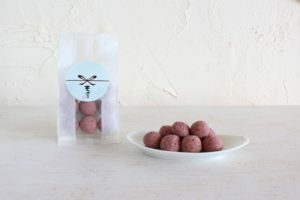 Using ingredients that are representative of Japanese food such as matcha, soba powder, kinako soy bean, Koya tofu, Honmirin, Rice powder), we want Japan’s young generation and people from overseas to know about traditional Japanese food. When you eat this Japanese cookie it makes you smile. It is such a magical cookie that spreads happiness. Feature: Made from soy bean, the taste is authentic with an aroma and flavour like no other. Using millet sugar from Okinawa and Ida salt from sea of Shizuoka, it is a taste that Japanese people love. The unique point is that it is full of minerals and it leaves a pleasant salty aftertaste. 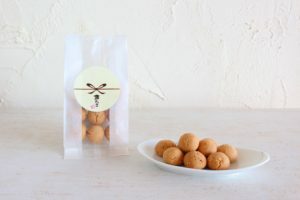 Feature: This snack is made from using Koya tofu, which is a representative ingredient of home cooking in Japan, and Matcha, which is a traditional Japanese ingredient. 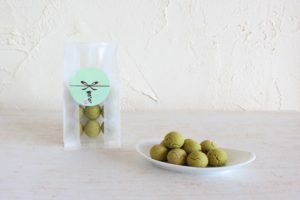 Koya tofu contains high nutritious value while Matcha contains a lot of Vitamin C. It strikes a balance in nutrition, at the same time the matcha aroma has a great effect of healing your soul. Feature: This is a gluten-free snack. This is made from buckwheat powder and buckwheat seed from Shinshu. A unique blend is formed with the buckwheat seeds and Tattan buckwheat tea. Buckwheat contains rutin, which is said to be effective in improving blood circulation. It is delicious and good for the heart and body.